Camping fridge – helpful thing trying to get fans of camping, campers, automobile travelers. Operates cooler bag in a thermos and drinks, and the products it retains the cold for quite a while. 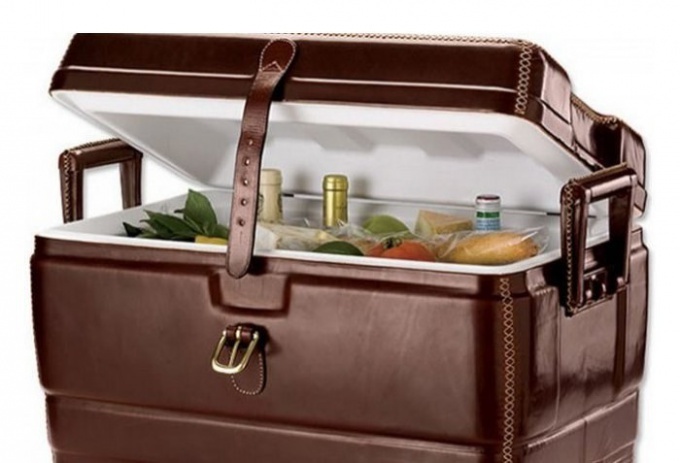 The cooler bag is essentially a simple hand baggage with a layer of insulation inside. Those who would like to purchase such a thing, but stops because of its considerable price, it is possible to try to make camping fridge on their own. To make a camping fridge, you will need a junk bag and a piece of insulation. For example, perfect foam polyethylene insulation white, whose one side is covered with a layer of foil. To buy it easy in any of the hardware stores. The transformation of an ordinary bag in the fridge takes very little time. Of insulation necessary to make the inner lining – will be something like a cross, whose rays must be identical in size with the walls of the bag and place their crosshair size should match the bottom. One of the beams is longer than the opposite is for the cover. Foil layer of the insulation should be facing towards the master. When raskryvanie insulation should be considered that after the design is glued, it must be inserted into the bag without difficulty. Therefore, the pattern is better to do 5-7 cm less than the size of the bag. The sides are held together with duct tape. They should thoroughly and carefully be fixed from the outside and the inside. Scotch is not necessary to regret from how quality will be made bonding depends on the safety of products. If the walls of the structure will not adhere to each other as stronger thermal effect should not count. How to make "cold accumulators"
In order for the cooler to function properly, you will need to make for the batteries of the cold. From what you can find in the home, perfect small plastic bottles. Each of them have to fill in a concentrated salt solution. To prepare the solution in one liter of water salt to take out six tablespoons. The resulting solution is bottled and freeze everything in the freezer. For best preservation, each of the products wrapping paper, newspaper. Everything should be inside as tightly as possible. A bag in which Packed products, better without extreme necessity not to open – so cold is better preserved. There are many other ways to increase the insulation.